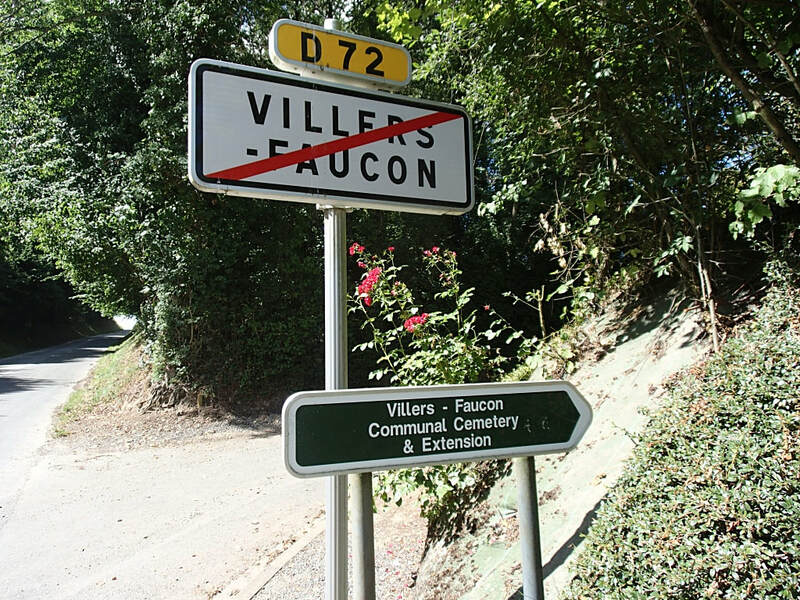 Villers-Faucon is a village about 12 kilometres north-east of Peronne. The Cemetery is situated north of the village on the road to Guyencourt-Saulcourt. 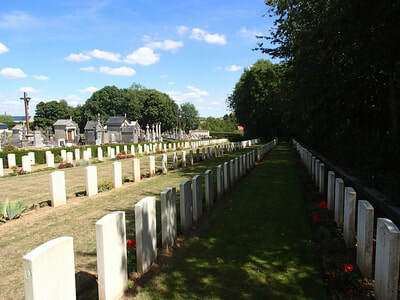 The Commonwealth graves in the COMMUNAL CEMETERY are those of soldiers who died in February-August 1917, or (in the case of two who are buried in Row B) in September 1918. They were made by the cavalry, the 42nd (East Lancashire) Division, and other fighting troops. 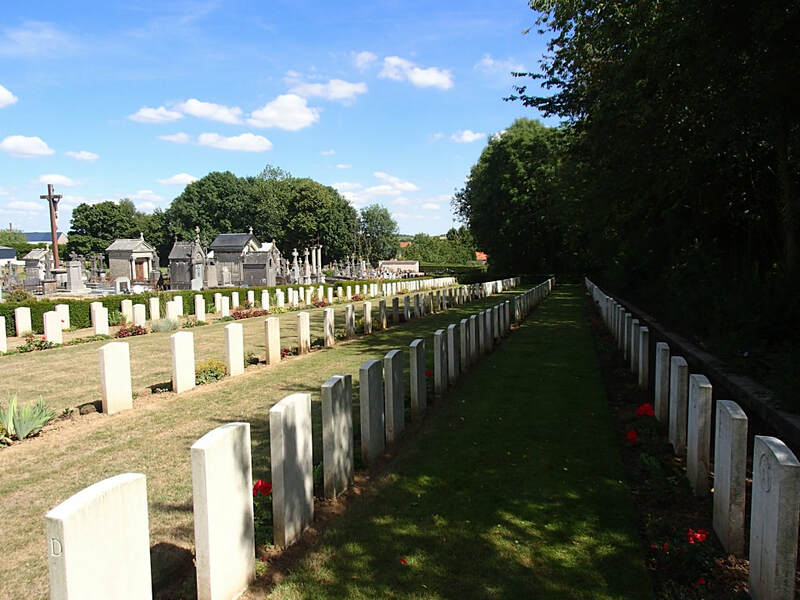 The communal cemetery contains 227 First World War burials, five of them unidentified, and 91 German graves. 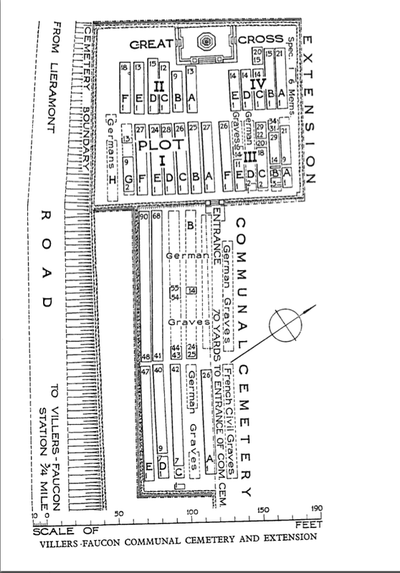 The adjoining EXTENSION was begun in April 1917 and used until March 1918. 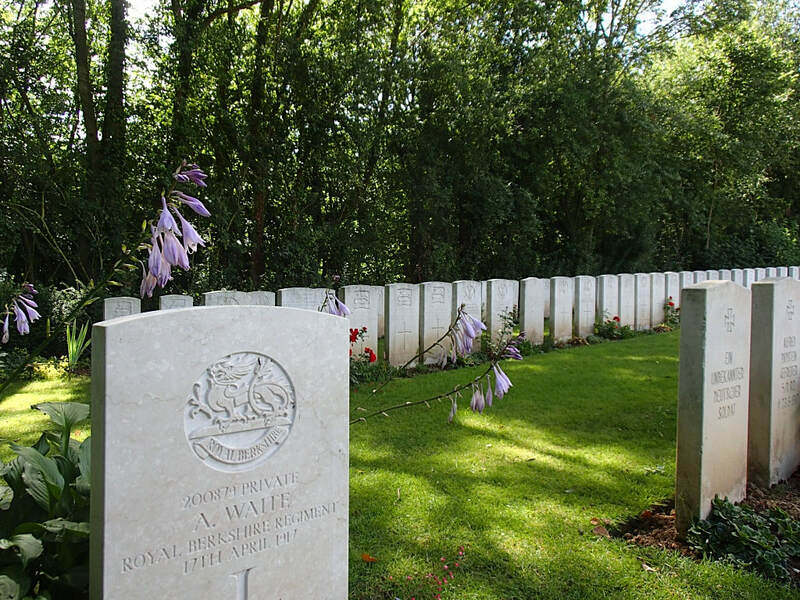 It was then used by the Germans, and Commonwealth burials were resumed in September and October 1918. Further Commonwealth graves were brought in after the Armistice from a wide area round Villers-Faucon. The extension contains 459 Commonwealth burials and commemorations of the First World War. 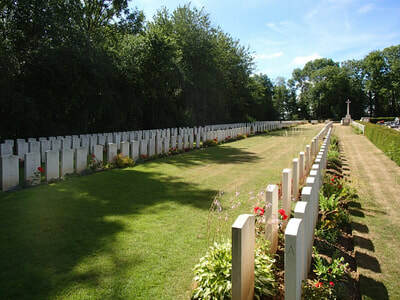 144 of the burials are unidentified but there are special memorials to six casualties believed to be buried among them. 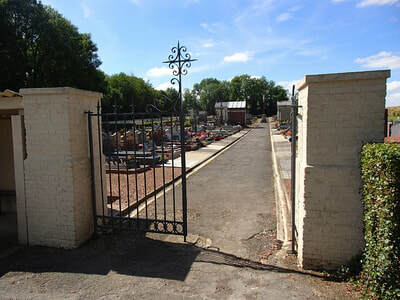 The extension also contains 66 German graves. 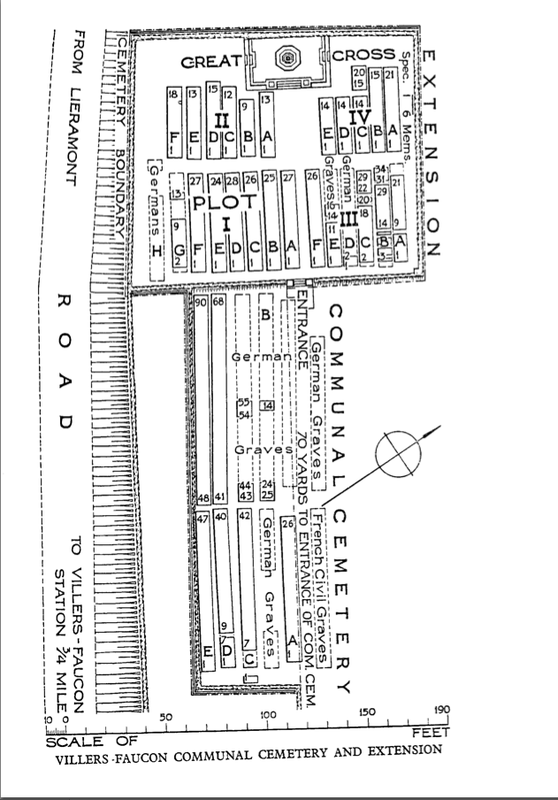 The Commonwealth plots were designed by Sir Herbert Baker. Second Lieutenant John Spencer Dunville, V. C.
1st (Royal) Dragoons. Died of wounds on 26th June 1917 aged 21, Row A. 21. Son of John and Violet Dunville, of Redburn, Holywood, Co. Down. Citation: An extract from "The London Gazette," No. 30215, dated 31st July, 1917, records the following:-"For most conspicuous bravery. When in charge of a party consisting of Scouts and Royal Engineers engaged in the demolition of the enemy's wire, this officer displayed great gallantry and disregard of all personal danger. In order to ensure the absolute success of the work entrusted to him, 2nd Lt. Dunville placed himself between the N.C.O. of the Royal Engineers and the enemy's fire, and thus protected, this N.C.O. was enabled to complete a work of great importance. 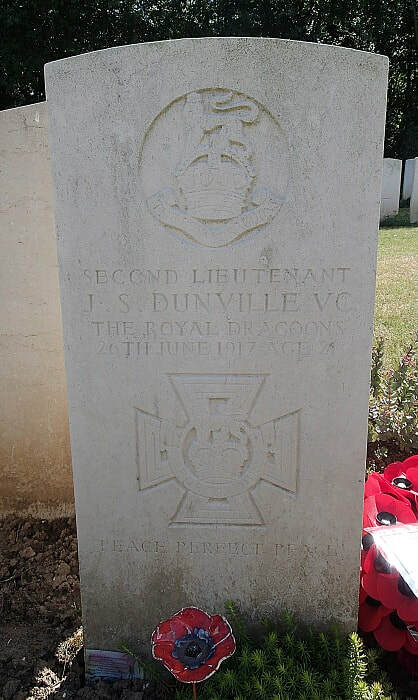 2nd Lt. Dunville, although severely wounded, continued to direct his men in the wire-cutting and general operations until the raid was successfully completed, thereby setting a magnificent example of courage, determination and devotion to duty, to all ranks under his command. This gallant officer has since succumbed to his wounds." Second Lieutenant Hardy Falconer Parsons, V. C.
1st/2nd, attached 14th Bn. Gloucestershire Regiment. Died of wounds 21st August 1917 aged 20. Row A. 16. Son of the Rev. and Mrs. J. Ash Parsons, of Leysian Mission, City Rd., London. Educated at Kingswood School, Bath. Medical Student at Bristol University, preparing for Medical Missionary Work. Citation: An extract from "The London Gazette," dated 17th Oct., 1917, records the following:-"For most conspicuous bravery during a night attack by a strong party of the enemy on a bombing post held by his command. The bombers holding the block were forced back, but Second Lieutenant Parsons remained at his post, and, single-handed, and although severely scorched and burnt by liquid fire, he continued to hold up the enemy with bombs until severely wounded. 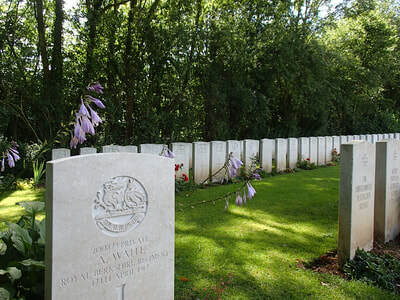 This very gallant act of self-sacrifice and devotion to duty undoubtedly delayed the enemy long enough to allow of the organisation of a bombing party, which succeeded in driving back the enemy before they could enter any portion of the trenches. The gallant officer succumbed to his wounds."